Neurobiologist, philosopher and Ph.D. (theoretical biology) from the Niels Bohr Institute University of Copenhagen with a project on the development of consciousness in prehistoric man (‘No man’s land’). I have been Research manager at Learning Lab Denmark, Danish University of Education, and research associate at the research center GNOSIS, Aarhus University, Denmark. 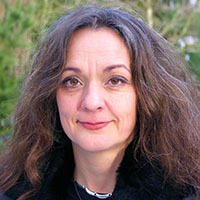 Author, co-author, editor and co-editor of both English and Danish books on biology, neuroscience, embodied learning, tacit knowledge and learning in outdoor education, including the anthologies ‘Learning Bodies’ (2008, along with Malou Juelskjaer and Thomas Moser), ‘The symbolic species evolved’ (from 2012, along with Frederik Stjernfelt and Terrence Deacon) and the monography ‘Derived embodiment in abstract language’ (forthcoming on Springer Verlag). Appointed to the steering committee ‘Technological Foresight on cognition and robotics’ under the Ministry of Science, Technology and Innovation. In 2012, consultant for the Swedish Academy of Sciences on ‘ Brain-based learning ‘ and in 2014 consultant for The Danish Ministry of Education on outdoor schooling as didactic tool. Research interests are on conceptualization and ’linguification’ processes in the neurobiological perspective; comparative psychology; phylogenetic and ontogenetic development of consciousness and abstract cognition; perceptual advantage of nature-based learning on meaning attribution and memory formation and specifically the impact of bodily experience on human learning. My current research explores ‘plasticity’ from the processes characterising the flexibility of lifeforms to the plasticity of culture. Plasticity as a dynamical response to an environment that changes is recognizable at the biological (individual) level as an ability to change one’s biology or behaviour in response to changes in the environment including both synaptic changes and cultural (especially linguistic) variability.